On Monday, we went to a farm to get some pumpkins and have fun doing all the other fun farm activities. Chris was off because of Columbus Day, and my brother, Luke, and his husband, Tyler, were still here because of Canadian Thanksgiving. We lucked out and got gorgeous weather... mid 70s and not a cloud in the sky! 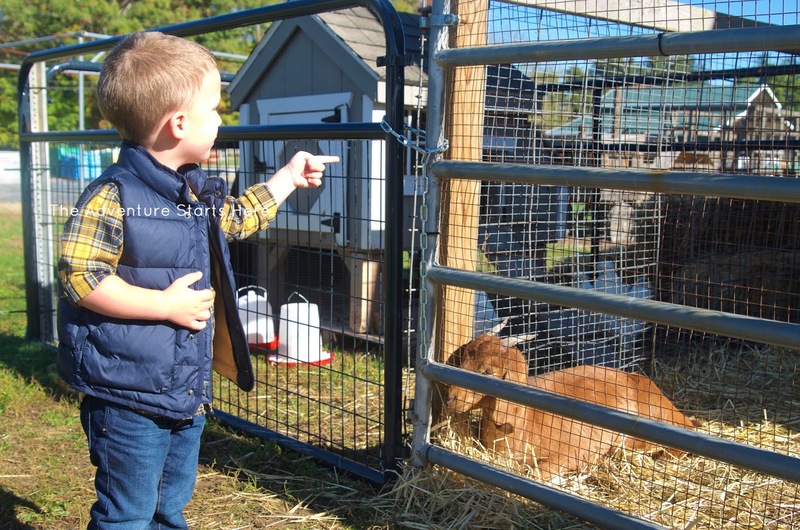 We had originally planned to go back to our local farm (Wightman's Farm), but we learned that they weren't opening until noon on Monday. Since Luke and Tyler had a 6+ hour drive home, we knew that wouldn't work. 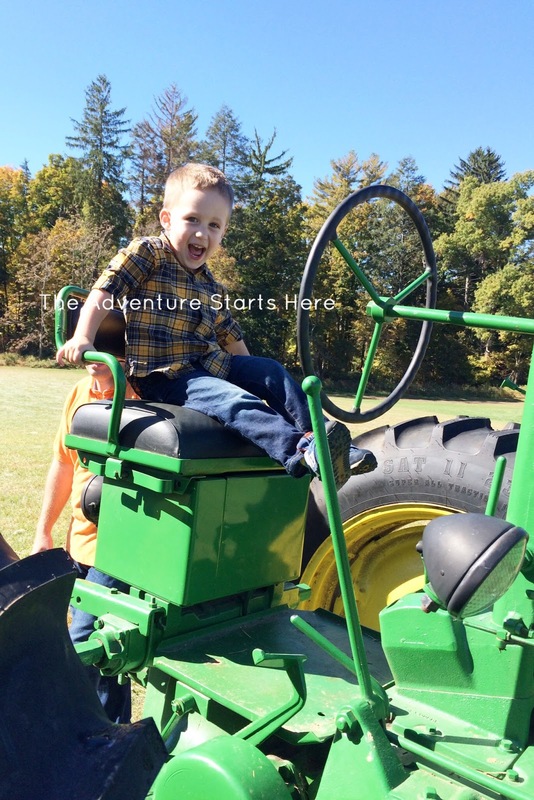 So instead, we found a farm 45 minutes north of us (and that much closer to home for them) that had lots of fun activities for both Noah and the adults. Everyone was such a good sport and went along with almost everything Noah requested. We all got on the back of this tractor play structure and posed behind the tractor cut out... it was too funny! 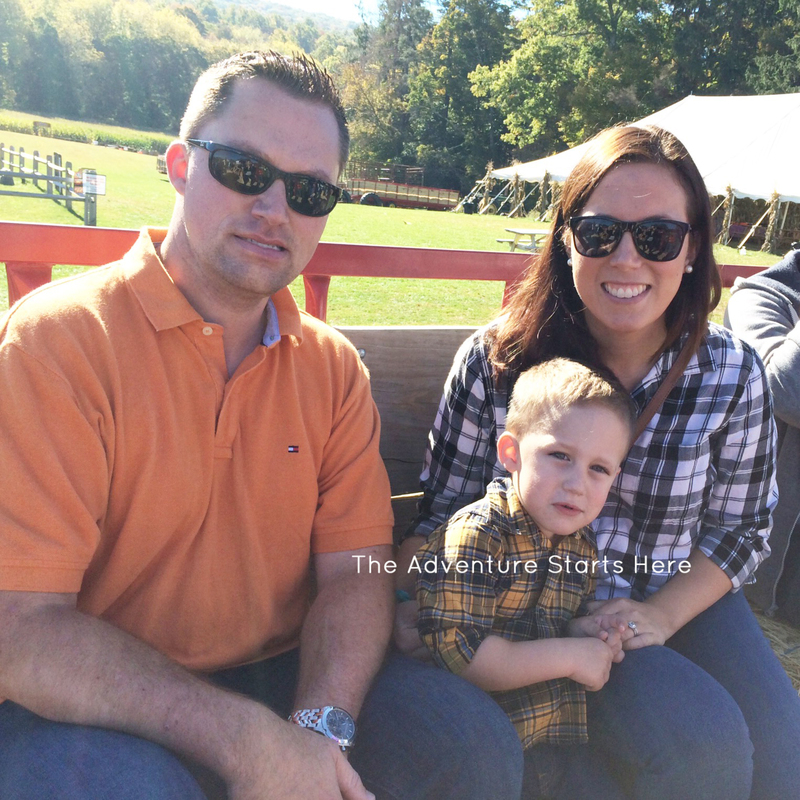 We of course had to go on the hayride around the farm and out to the pumpkin patch. 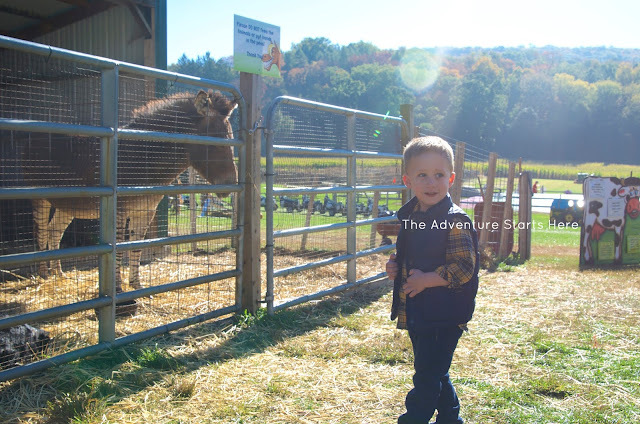 Noah went on a hayride last week as well and was super excited to go on one again and bring Grandma, Papa, Uncle Luke, and Uncle Tyler this time! The pumpkins weren't on a vine or anything, but that doesn't really bother me... 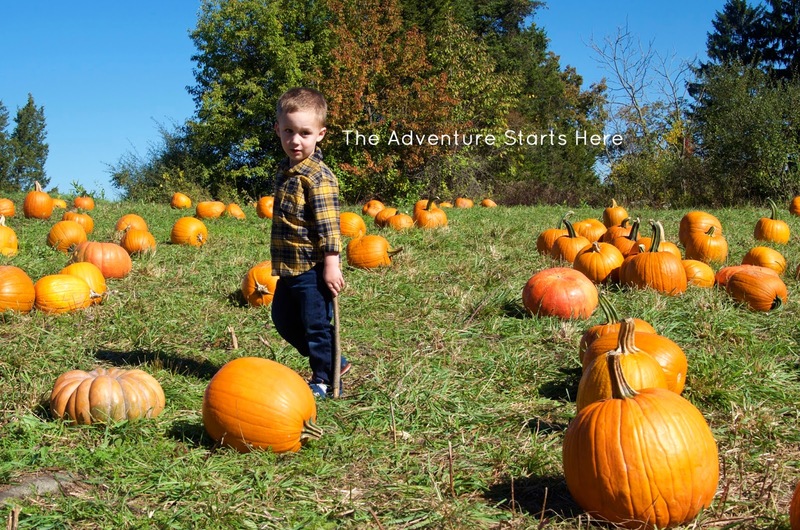 I've never actually been to one where they are on a vine ;) Noah immediately found a stick and started drumming on the pumpkins and pointing to the ones he wanted. 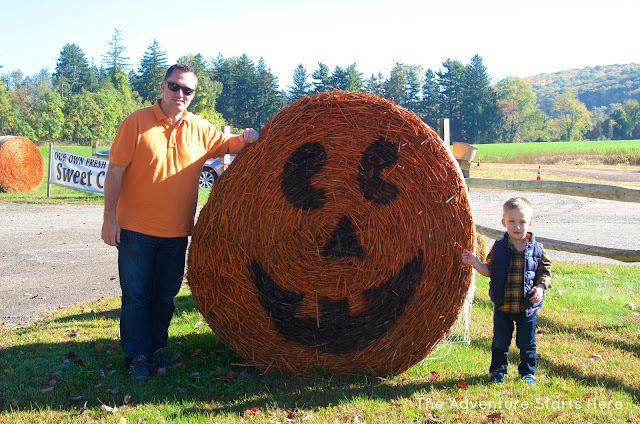 We decided to pick one out to bring back and get the rest in the store (so we wouldn't have to carry too many back on the hayride). Next up, was some fun for the adults. 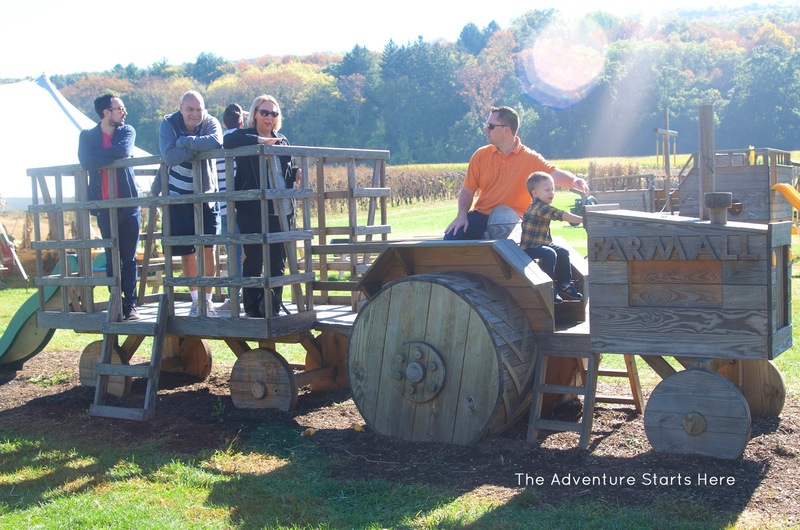 One of the reasons we love our local farm is that they have a pumpkin slingshot. 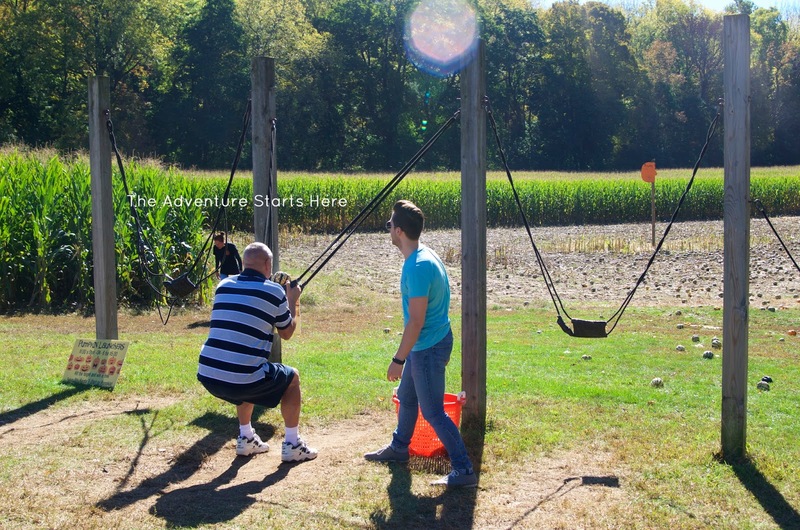 When the timing didn't work out to go there, Chris searched for another farm that had a slingshot. That's how we came across this farm. He was so excited that they had a "corn launcher" as well, but he was super disappointed that it wasn't working when we were there so we didn't get to try it out. 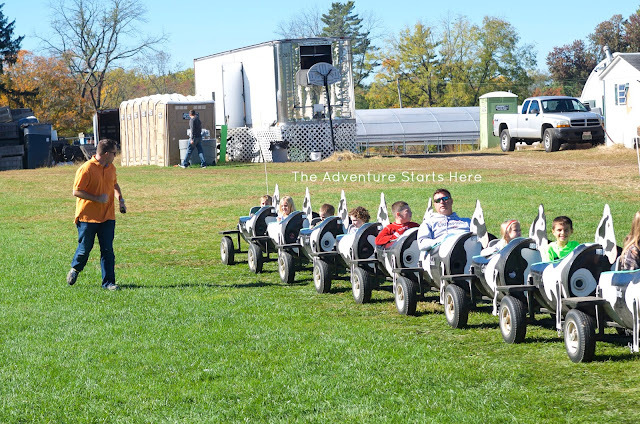 The pumpkins slingshot was fun, but a lot harder than the one at Wightman's. Just like last year, Tyler was the best at it by far! 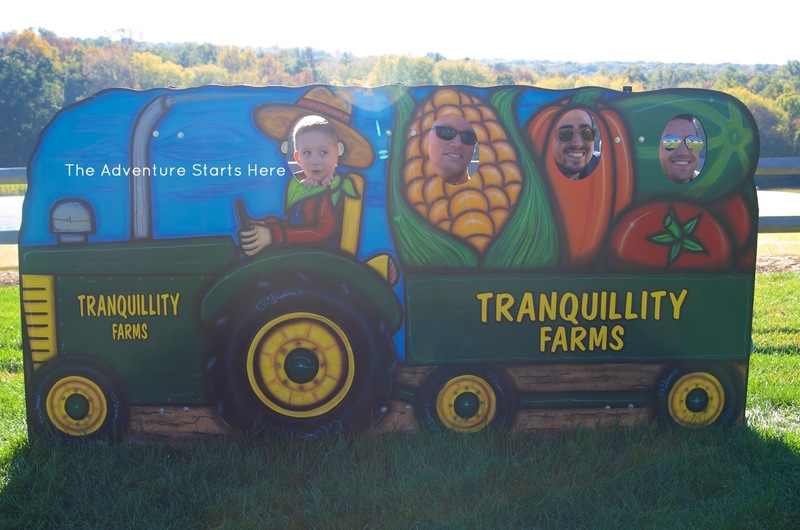 We even went on a corn maze while at the farm. 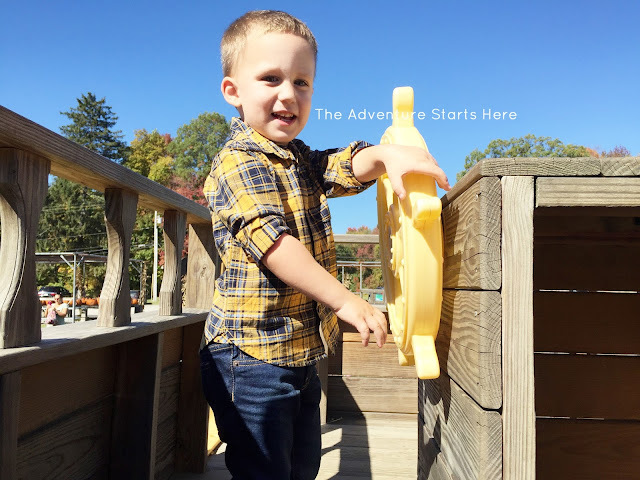 Last week, Noah did a little kid "hay maze" and loved it! It was tall enough that kids couldn't see over but that adults could see over the hay bales to see which way to go. 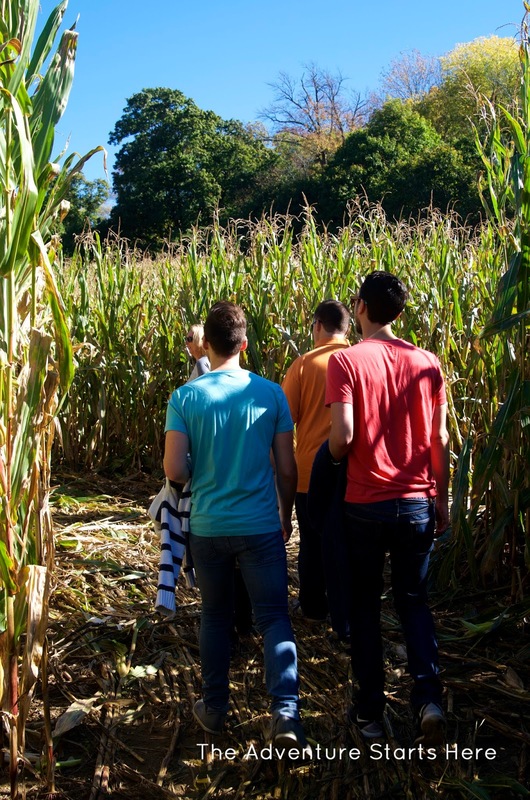 This corn maze was a totally different story. My dad ended up going ahead and the rest of us gave up and just went back to the entrance. We waited by the exit waiting for my dad and said, "What took you so long?" when he came out. I didn't think he'd actually believe us that we made it to the exit before he did, but apparently he did! We then had some lunch and let Noah play in the little kid area. 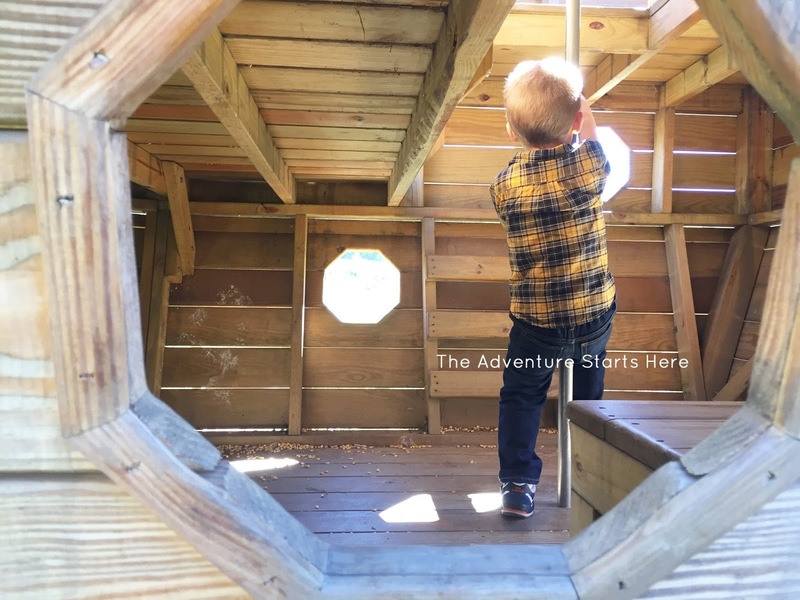 They had a "sand box" of corn kernels, a super mini hay maze, and a pirate ship playground. 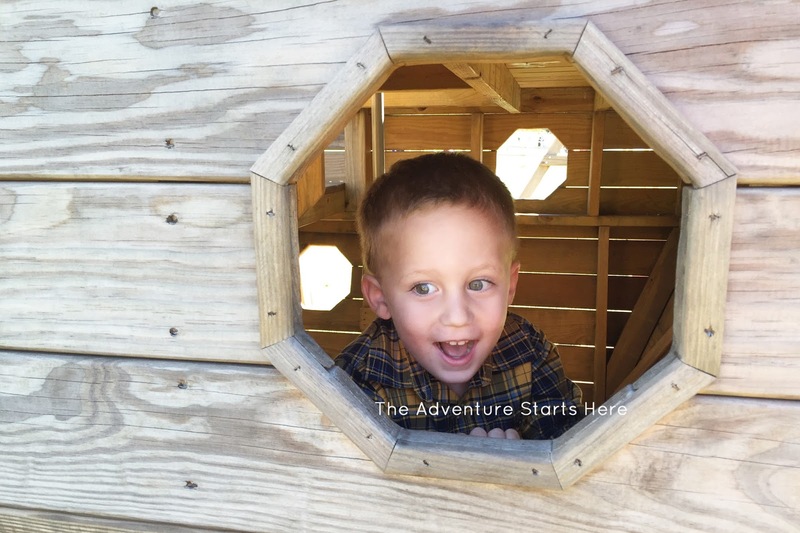 Noah had so much fun and did not want to leave! This is the kind of day that really makes me love Fall! So fun! He looks so cute in his plaid shirt and vest! :) Love when kids play in corn....so much fun! How fun! Great pictures, too. 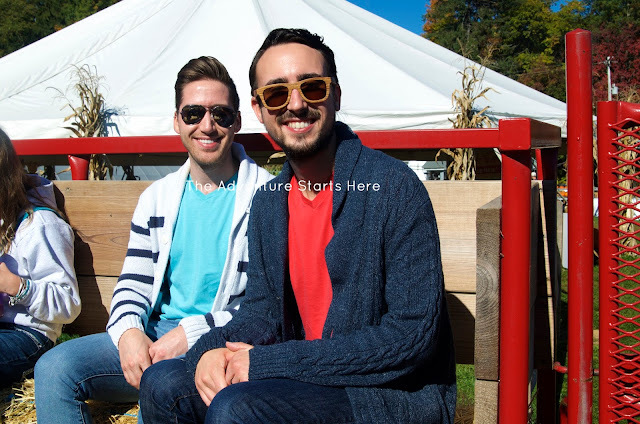 I love the pumpkins and gourds in that 2nd picture. And of course the little guy is handsome. I’ve never seen a zonkey! What a wild combination! 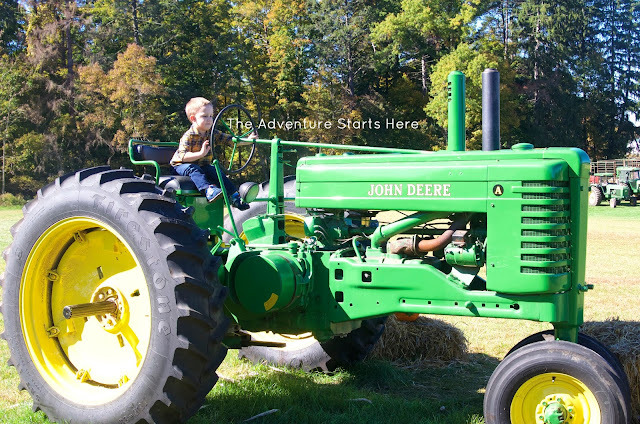 That wooden tractor looks like every little boys dream. Oooh, a corn maze. I’ve always wanted to go in one of those. Were you having any thoughts of Children of the Corn, though? That movie used to freak me out. Looks like a great day was had by all. 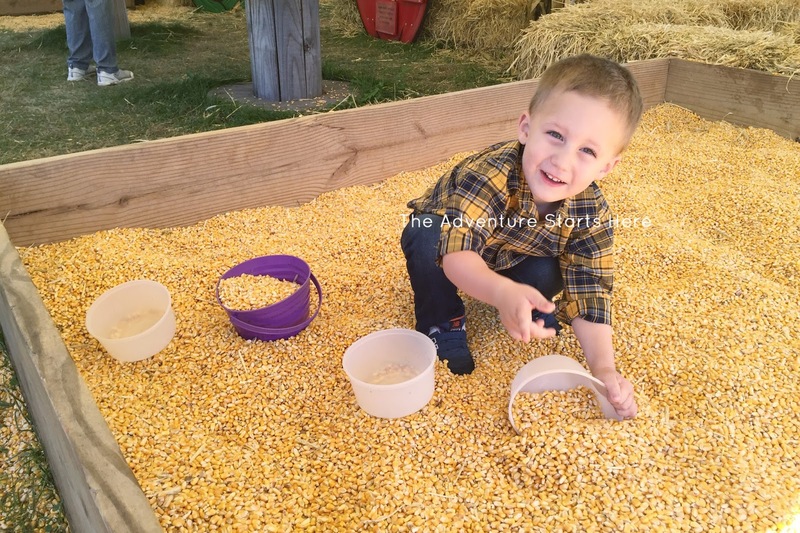 And I agree…this is the stuff Fall is made of! Love it. So much fun! 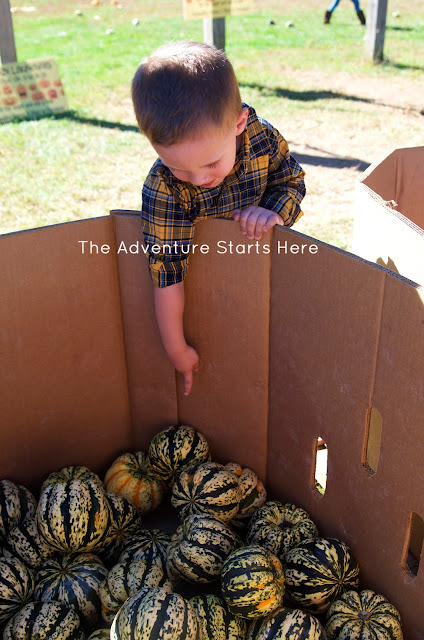 We haven't made it to a pumpkin patch yet, but I can't wait! 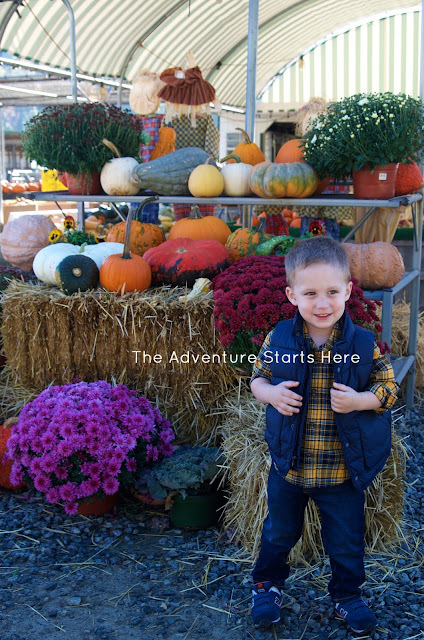 I love his plaid shirt and little vest! Perfection! 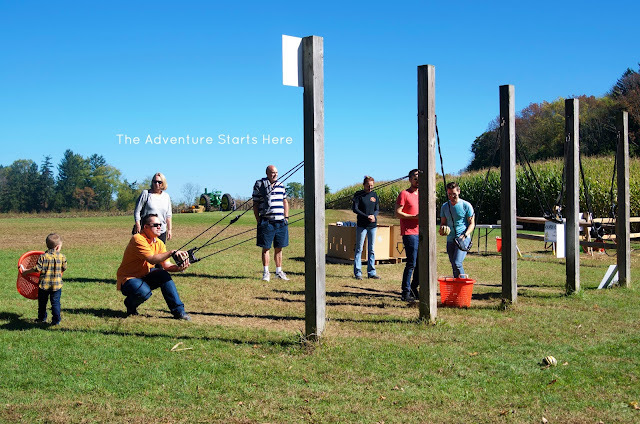 That slingshot looks like so much fun. I want to try it!!! 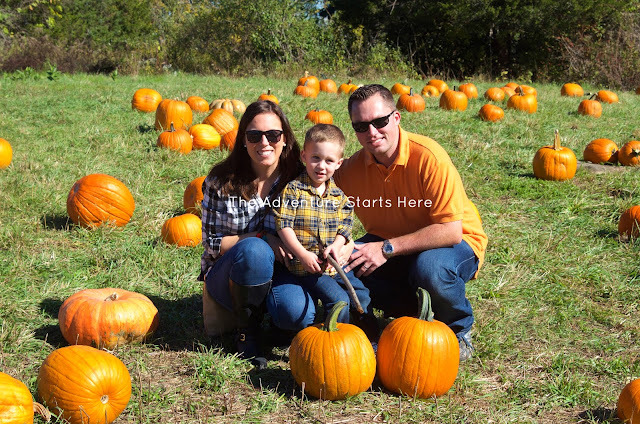 What a fun pumpkin patch!! We are going on the 20th and I can't wait. That picture of Noah by the zonkey is gorgeous. And lol at the tractor photo-op!!! Lily had a blast with those at our patch too! Awww such a big boy riding the train all by himself! 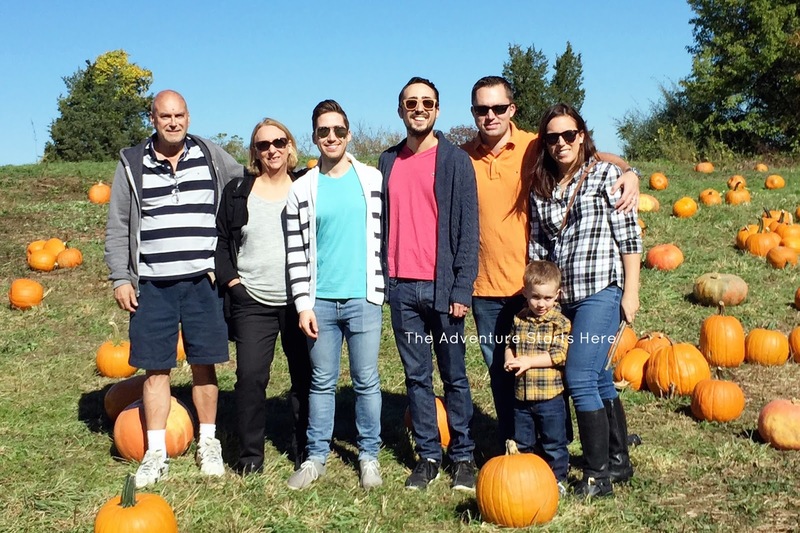 Such a fabulous pumpkin patch! You really captured some fun moments! Noah obviously had a blast! This looks like so much fun!!! 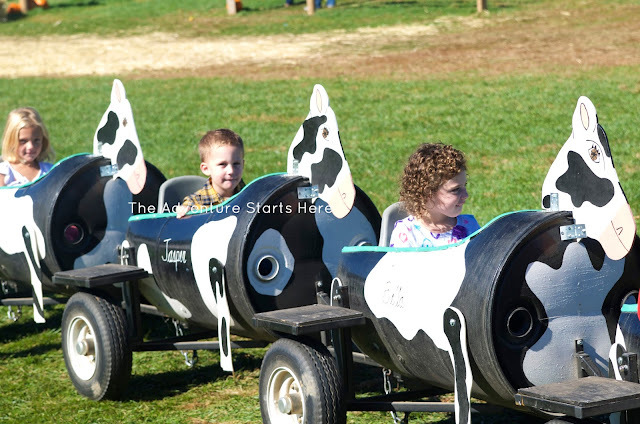 We have got to get to pumpkin farm before it's too late! My oldest would love the corn maze and that cut out tractor.